Lift Chamber Key is a Key Item in Dark Souls 3. 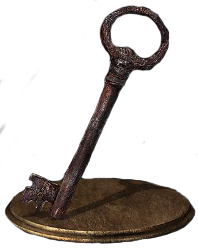 Key to the room of the lift that descends to the deepest dungeon in Lothric. A surviving Darkwraith from the land swallowed by darkness, is said to be there. Unlocks an elevator to a Darkwraith mini-boss just below The Tower on the Wall bonfire in High Wall of Lothric. It drops the Red Eye Orb. Leonhard gives you the key. After obtaining 1 Pale Tongue, and lighting the Cliff Underside bonfire or defeating the Curse-Rotted Greatwood in the Undead Settlement, he will give you the Lift Chamber Key to the locked door below the Tower on the High Wall bonfire. for those still having trouble triggering the key, if you have the tongue and killed the greatwood or got the bonfire, simply teleport to any area then return. you dont have to quite the game or anything. You do not need to kill the curse rotted greatwood to get the lift key. I&apos;m not sure what co-requirements make this the case, but I have obtained the lift key from here later in the game (Irithyll Dungeon) by simply talking to him in the shrine. Just git gud and kill Leon he carries like 3 flasks, and he&apos;ll even try to use a fourth if you get him low. Super easy enemy. I recommend straightsword. I killed him and got the key as well. If anyone is still having problems triggering his key dialogue, try attempting to open the door and talk to him again. The "it&apos;s locked" notification seems to do the trick. Leonhard left before I got the key from him??? This is the lift chamber key from dark souls 1!?! You know, the unused content! You guys do understand that you need to bring him a pale tounge in order to get the lift chamber key. Once you do this you can go down the lift to fight the darkwraith. I lit the appropriate bonfire and killed the rotted tree. Leon hard doesn&apos;t offer anything other than the Cracked Red Eye Orb any suggestions? Leonhard gave me a cracked red orb but no key to the dark wraith. Any help? I didnt have the key and was really far. It was the pale tongue that was missing. Without it Leonhard wont appear. He gave me the key before I even encountered the Curse-Rotted Greatwood, so that&apos;s not a real requirement. The name of the key is "lift chamber key". just pointing that out.